Much has been written about decluttering lately. And so, of course, my thoughts turn to bird feeders. A common bit of wisdom regarding decluttering is to ask yourself if an item brings you Joy. When I fill my cylinder feeder with a new No-Mess seed cylinder, I notice Blue Jays coming in groups. Perhaps the first jay to discover the gleaming peanuts will stand atop the pole and give a little bounce up and down as he calls to the others in his tribe. Then the hammering begins; the birds’ feet holding on tightly, their heads moving back and forth, excavating each peanut with precision. Then off the Jay flies to a branch to eat its prize. Or maybe it plans to stash the peanuts. The flurry of blue from feeder to tree branches is so beautiful to watch. Okay – Joy with the cylinder feeder… keep it! Then I consider my suet feeders. I have a lot of those. Tail prop feeders – I have two of the extra-large version. Last time I filled them with Nuts and Berries Suet I was in Boyne City, and when I was done, I called out to the woods ,“Hey Buddy (my male Pileated Woodpecker’s given name), I just filled the feeders for you!” And I kid you not; within two minutes, he flew into the woods along the road and hammered away at one of his favorite trees, doing some serious excavation. Then, as I backed away from the feeders, he came in on his landing tree. 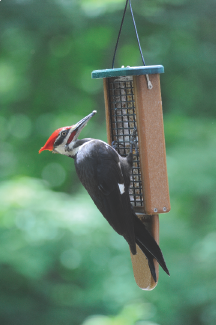 By the time I was in the house, I had the Pileated Woodpecker on one of the double tail-prop suet feeders, and a Hairy Woodpecker on the other one. 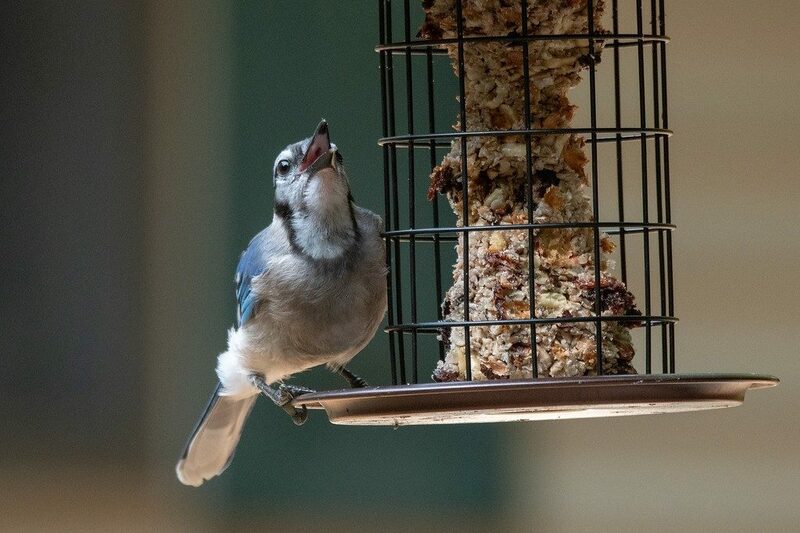 Okay – true Joy with the double tail-prop suet feeders – keep them. All of them. Next I reflect on my finch feeders. Yes, that’s plural as well. 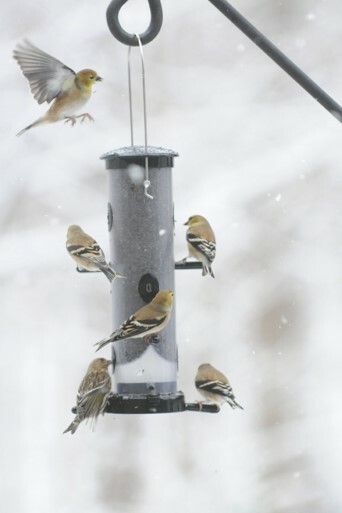 This past winter, it was so exciting to watch for finches of all varieties. The Winter Finch Forecast predicted we would have many irruptions into our area. This happens when seed crops are not optimal in Ontario, so irregularly occurring species move south in search of plentiful food sources. Pine Siskins can be identified at a distance by their very pointy beaks, looking like just-sharpened pencils. Careful observations need to be made to notice the potential Common Redpoll – such a dainty bird with the sweetest red cap. 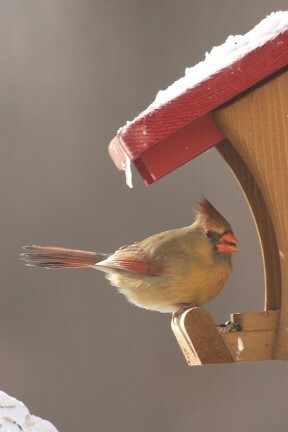 Of course, these winter visitors mix in well with American Goldfinches who visit the feeders all year long. As we move into spring, I watch my goldfinches carefully with binoculars to note when I see the first hint of yellow feathers as they molt into spring plumage. Joy with the finch feeders – keep those too! Time to evaluate the large hopper feeder, which holds an abundance of seed. I am relieved when the birds visit first thing in the morning, proof they made it through another challenging night. I feel so fortunate to be able to provide them with readily available food that has no shells, allowing for quick energy. If it’s cold enough, birds can go through all of their fat reserves in one night just to keep alive. More Joy with the foundational hopper feeder – keep it. Then there is the peanut feeder, a draw for specific birds. 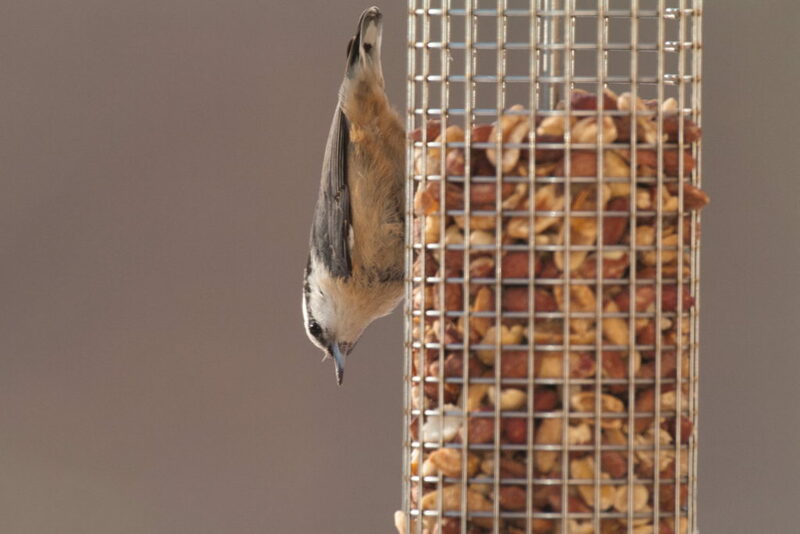 It is certainly a favorite of Red-breasted Nuthatches that cling on upside-down. I love to watch their bodies teeter back and forth like little sledge hammers as they pound away to extract a peanut. They make the dearest sounds, similar to small squeak toys. It has been an irruptive season for Red-breasted Nuthatches and I wouldn’t want to miss a moment of them. 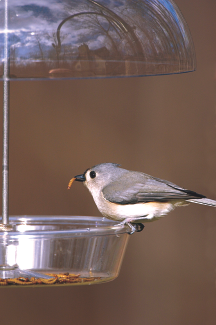 Joy with my peanut feeder – keep it! Finally, my thoughts turn to the variety of foods I offer the birds when I’m in a time crunch. For example, I can simply open a bag of Bark Butter Bits and pour them into my Dinner Bell feeder. This feeder is the most versatile and I dare say one of my absolute favorites. I can lower the weather dome so just the smaller birds fit between the tray and the dome, even excluding House Sparrows if low enough. It gives the Black-capped Chickadees a place they can dart to, picking up the beak-sized Bark Butter Bit and flying off to a branch. It is so fun to watch as they hold it in their feet and eat it with dainty bites. The Dinner Bell is also great for mealworm feeding. Mealworms give birds the protein they need for feather production when molting and for calcium when they are ready for egg-laying season. Okay – Joy with my Dinner Bell Feeder – keep them. Both of them. So much for ridding myself of the “clutter” of bird feeders. Anything that bring me this much Joy is a keeper!